The weighty elegantly bound volume, published by Pacini Giuridica in two languages (Italian and English), part of the special series "Freedom of Belief", is the report of the high-level technical and international convention held on 18th and 19th January 2018 in Florence, at the Sant'Apollonia Auditorium. The work is available online and in specialized bookshops. In front of a large audience of jurists, academics and representatives of various religious confessions, Professor Silvio Calzolari, FOB Secretary, opened the event emphasizing the secular character of the Federation and describing its purpose, which is the promotion of the freedom of belief, whatever it is, including the freedom to disbelieve. 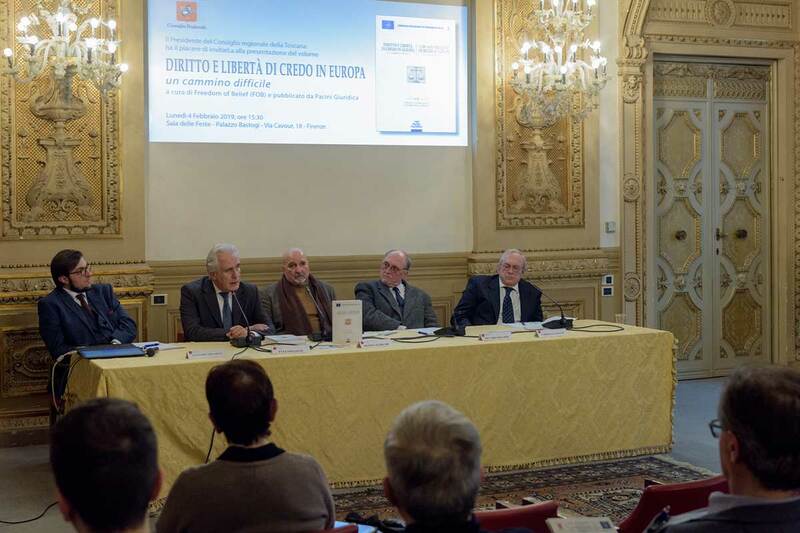 Professor Calzolari recalled that the 2018 conference was held under the auspices of the Secretary General of the Council of Europe (Dr. Thorbjørn Jagland), that it received the patronage of the Tuscany Region, that of the Parliamentary Assembly of the OSCE (Organization for Security and Cooperation in Europe) and of the University of Florence, and was honored with the awarding of the Medal of the President of the Republic Sergio Mattarella. Calzolari also read a brief greeting from the Vice Prefect of Florence, Doctor Nelly Ippolito Macrina, authoritative speaker at the convention of which the book of the proceedings has been presented. There were then the interventions of the President of the Council of the Region of Tuscany, Dr. Eugenio Giani, of Hon. Riccardo Migliori, past president of the OSCE Parliamentary Assembly, of FOB President, Human Rights lawyer Alessandro Amicarelli and of lawyer and philosopher of law, Fabrizio d'Agostini. Following, President Alessandro Amicarelli, analyzing the activities of FOB during last year and the extra-European commitments of the Federation, spoke, among other things, of the religious movements persecuted in China and the role of the government media in creating fake news against such confessions. To the faithfuls of these persecuted groups, such as the Church of Almighty God, a movement that – according to official Chinese sources in 2014 reached the four million members – asylum applications are denied by Western governments, as officials who process the applications and grant authorization documented themselves online finding distorted and negative information created by the Chinese government media and then drawn on by the Western media that "certify" them. Hence the need to create an operational manual to train those who must decide on the applications of asylum seekers and on many other issues. Amicarelli, in exposing the chronology of the activities carried out by FOB in its relatively short but intense life, pointed out that the objective of FOB is to make what already exists operational. FOB does not want to create anything new; there are international conventions and national laws that need to be implemented. To this end FOB renews its constant commitment of direct contact with representatives of national, European and international institutions. Also Eugenio Giani, a man of vast culture inspired, among other things, by the legendary Florentine mayor La Pira, describing the book of the proceedings, spoke of a volume of reference. The President of the Council of the Tuscany Region has produced a wonderful lectio magistralis on political and geographical Europe, on the varied reality of religions in Europe and in Florence and Tuscany, the cradle of humanism that, with Dante, Cosimo de Medici and the Renaissance, gave an example of integration and constant comparison among the great religions of that time, a tradition that continues today as then. The last speaker of the event was lawyer Fabrizio d'Agostini, founding director of FOB and intellectual father of the convention "Law and Freedom of Belief in Europe, an arduous journey." His speech represented the closure of this project and the start of a new great commitment for the Federation: the ambitious "Right to Truth" project, which will also be the theme of next FOB international conference. It is about the elaboration and presentation of a completely new right. A right that should be adopted and implemented by all nations if we really want to face the challenges presented by a society undergoing a very rapid change. Challenges generated by modern and very fast communication technologies and dissemination of information and misinformation and by the frenetic melting pot of cultures generated by the enormous migratory flows in progress. Without the "Right to Truth" there can hardly be a freedom of belief, not to mention many of the other human rights. Even less, the guidelines of the FoRB program (Freedom of Religion or Belief), adopted six years ago by the European Union, can really be implemented. Here is the text of the intervention The right to "truth" by Fabrizio d'Agostini. The video recordings of the interventions (in italian language) can be viewed visiting this page. The Convention "Law and Freedom of Belief in Europe – an arduous journey" was based on some implicit rights. In particular, all the interventions and reports – complaining about the violation of the right to belief and religion or claiming the right to freedom of belief and religion, or describing facts, events or situations – also complained and claimed another right without which every civil and human right appears vain and that is the right to “truth”. Other rights were also implied, such as the right to "resistance" or the "rule of law", but the one to the truth seems to me in a certain way to precede and to found them all. We believe that it is now possible to consider "truth" as a juridically protected asset in itself and for itself. The violation of the truth produces damage to the individual, but the social damage is much deeper. In the Italian legal system there are criminal cases and also some civil ones that sanction its opposite: the "false" as a crime, but the "protected good" is not the truth in itself and for itself, but the "confidence", the "trust” that the code translates into "public faith "and that by means of sanctions implicitly establishes the obligation of correspondence to the reality of conduct. On the other hand, there is no norm in the Italian legal system that protects the truth in itself and for itself as an autonomous right. The "right to truth" is not present in any constitution or fundamental law. Even in the thirty articles of the Universal Declaration the right to "truth" is not declared to be a human right. But on closer inspection, the whole system of rights, in all constitutions, acts, documents, recognizes the right to truth as its implicit assumption and links it to the rule of law and the form of liberal democratic government. However, no civil right can survive in the absence of truth and all vanish into lie. The right to truth is the right to know how things really are. To talk about the right to truth also means to talk about falseness and deception. Kant, "aware of the different status of knowledge and action", believed that the cause of diversity "should be sought in that ‘putrid plague’ of human nature" which is the "power to lie". Kant thought, unfortunately deluding himself, that the bank to that "putrid plague" was not a difficult positive law but should rather be the "moral law" in the heart of man. The question of truth, therefore, concerns the moral action in the man as an individual. In the relationship of the individual with others, he becomes "political" in the high and noble sense that the term had in "politeia" and, without solutions of continuity, it translates into the right action, the one based on reality, on the "this is how things are” ( the Greek term "aletheia" which indicates the truth, also indicates "sincerity" and finally "reality itself") and this is how the truth that precedes every lie about civil rights, translates into social justice. "Justice is the first virtue of social institutions, just as the truth is of systems of thought". Therefore the right to truth should be an autonomous right and the truth should be the norm of conduct of the right social action. The question of the examination and comment of "communication" emerges in the foreground, both when it comes to the affirmation of the truth about civil rights and in particular the right to freedom of belief and religion, and when it comes to its denial or mystification. What then is the current situation of communication on the rights of belief and religion in Europe and more generally in late modern Western societies formally governed by liberal democracies? The answer is not particularly reassuring. Although human rights and before all others, that of belief and religion, are intimately linked to liberal democracies and were born within the same historical path, these same liberal democracies in which the rule of law has been affirmed, too often are not governed by "truth" and therefore by "justice", but by the majority and when, in an era, the culture of "truth" is extinguished, the majority of the historical manifestation of democracy is reduced only to the attribution of the "power of ..." and the "life" of civil rights becomes difficult if not impossible. The question regarding the rights of freedom of belief and religion is a dating issue, but has become particularly relevant in relation to the extraordinary increase of the mass media and the uncontrolled and uncontrollable multiplication of sources. In place of the moral law in the hearts of men, it seems that the power of lying, about which Kant was complaining, has taken far more vigor. It's the explosion of internet and the power of social media. This has transformed the quality of communication from within, making it ever more rarely possible to be a communication of the "truth" and a vehicle of social justice (recent incidents on the manipulation of messages; on false news; on the appropriation of personal profiles and distortion of the truth for commercial intentions or, worse, for electoral ones) and this often and increasingly become the brutal communication of the lie, of the false news, of the propaganda, of the half-truths. At the same time, with specific regard to social media, communication is increasingly anonymous, abstract, ethereal, without subject, almost born from nothing, multiplied to infinity, often infamous, often destructive. These are very current topics that are much discussed and this is today the most dramatic difficulty in the search for "truth". The quality of communication has changed profoundly. The New Religious Movements, the spiritual movements and the minority beliefs are and must be in late modernity an essential and constitutive element of the European democratic identity. An identity that has painstakingly made its way between historical falsehoods, theses without scientific foundations, propaganda and disinformation. And it is all this "non-truth" that has given rise to some of the greatest catastrophes of the last century. The tragic fact is that democratic identity in these new times has yet to make its way despite independent authorities and directives on radio television communication. As a recent consequence of the epochal transformation of the means and forms of communication, the lines of the flow of political power – once always from top to bottom – are now and often from bottom upwards, and the disasters of the mass media when dishonest, therefore, directly affect without mediation the establishment of a mature democracy, and civil rights are instead the source of persecution and discrimination. This is a dating "dishonesty". Born together with the press and the propaganda systems. It is only the quantity and extent that has become enormous and the space occupied by communication through Internet, social media, mobile phones, iPads, tablets, in all its forms, constitutes today the difference compared to yesterday, but current remains the warning of Simone Weil according to whom the publications intended "... to influence what is called opinion, that is, in reality the conduct of life, are real acts and must be subjected to the same restrictions to which all acts are subjected. In other words, they must not bring any illegitimate damage to any human being, and above all they must not contain any explicit or implicit denial of external obligations toward human beings ...” or the equally hard warning by Popper that "we need to get the media to recognize and tell the truth, to see the dangers they themselves hide, to develop, like all healthy institutions, self-criticism and finally, to correct themselves. It is a new task for them. The damage they cause today is great”. It is also on the basis of this framework and of the urgency of trying to reaffirm the value of truth and of its communication that FOB promoted the Convention on Law and Freedom of Belief in Europe last January, and is now proposing a reflection jointly to an intention on the "right to truth". FOB project is a scientific and secular one and is that to collect contemporary European history of discrimination of religious and belief minorities, of associations, of churches, of spiritual movements and that of individual members and compare "their" truth. At the same time, create a European archive of Bad Literature, Misleading Literature, collecting monographs, articles, writings, recordings, interviews and programs that should be judged to be contrary at all or in part to the "truth". This is in a certain sense a project that would be for FOB the continuation of the conference of which the proceedings are presented today. Finally, the conclusion of this presentation is in the dialogue with which Plato remembers that the renunciation to the search of the truth on the part of wise men leaves it at the mercy of wild and savage minds and marks the end of civilization. It could not be said simply and better. The notion of truth used is the realistic one. In the dialogue Cratilo, the great dialogue on the origin of the names, Socrates, responding to Hermogenes, argues that the real thing is "how things are". The realistic notion from the Platonic dialogue of the time to now is that used in logic, philosophy, politics and in everyday communication (Franca D'Agostini, 2017). The right of resistance is not present in the Italian Constitution. It had been inserted in art. 50 (then article 54) of the draft of the constitution in the commission of the 75 on the proposal of Hon. Giuseppe Dossetti. The text was: "When public authorities violate fundamental freedoms and rights guaranteed by the constitution, resistance to oppression is the right and duty of the citizen". The proposal was not approved. The rule of law is a political model and is opposed to the police state. It importance has been specified by Kelsen and the school of Florentine public law. The conviction that in a state of law there was no need to expressly express the right of resistance was the reason why the proposal by Dossetti was not approved. The issue is today discussed, not without difficulty, by philosophy, sociology and political science dealing with so-called aletic rights (Franca D'Agostini, 2017). Criminal Code, Book II, "Of Crimes Against Public Faith" ... articles 453 498, counterfeiting coins, stamps, states, deeds, etc. Z. Bauman, Stranieri alle porte (Strangers at the Gates), Laterza, 2018 page 83. John Rawls, Una teoria della giustizia (A theory of Justice), Feltrinelli, 2010, page 25. Simone Weil, La prima radice (The First Root), SE, page 31. Karl Popper, Lezioni di questo secolo (This Century Lessons), Marsiglio/Saggi, 1994, page 80.